Myles Hickman’s second five-wicket haul in three matches helped Thorpe Arnold to fight back and secure their first Division Two win of the season on Saturday. The home side looked in danger of sliding to a sixth defeat of the season when they were bowled out for 143 by Countesthorpe, Hickman (38) and Mark Starkey (36) providing crucial middle-order runs. But opening bowlers Hickman (5 for 48) and Joe Anderson (3 for 39) helped skittle the visitors for 127, despite Matt Toon’s 51. 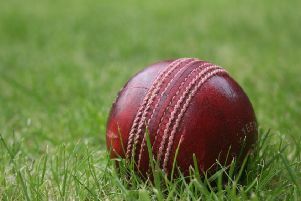 Up in the Premier, Syston Town closed to within eight points of the summit with a seven-wicket victory at struggling Uppingham. Mo Pardesi (4 for 11), and two wickets apiece for George Corbett, Faizal Jariwala and Ram Ghuman skittled the hosts for just 104. An unbeaten 47 from wicketkeeper Charles Wootton saw Syston to victory inside 19 overs. Melton Mowbray moved up to third and within 15 points of Division Three leaders Hinckley Town Seconds after their fourth win in six. After restricting the visitors to 176-7 from their 45 overs, Melton endured a few stumbles before chasing down their target with four overs and three wickets to spare. And Ashby Carington made it five wins out of five as they continued their strong start to County League life in Division 10 East. Alan Smith carried his bat for an unbeaten 129, supported by skipper Nigel Lewis (78) and Louis Massarella (52 not out) as they posted an imposing 296-2. Ten-man Uppingham Thirds were never in the hunt and collapsed to 64 all out, Tom Mason taking 3 for 11.